Everyone in Bayville New Jersey eventually replaces their tires, whether it’s because they’re worn out or they’re just looking for something different. There are so many great tire choices in Bayville New Jersey, it can be difficult to sort them out. Let’s group the broad spectrum into several categories that will help in the selection process. One category is often referred to as “summer tires”. Summer tires are designed to be driven on the road when temperatures are generally above 45 degrees. Their tread design is optimized for traction on dry roads in Bayville New Jersey and they’re also able to effectively displace water on rainy roads. Now the rubber compound gets a little hard and stiff as temperatures drop below 45 degrees as it occasionally does here in Bayville New Jersey. And the tread which handles dry roads so well, can get packed with snow or mud – which provides very little traction in those conditions. Summer tires can be purchased with an emphasis on handling performance, smooth ride or long life. Your Bayville New Jersey tire professional at Bayville Auto Care can help you find the right tire for the way you drive. For many people, an all-season tire is the answer. You will give up some of the performance at the extreme ends of the summer tire/ winter tire spectrum, but you will find a long wearing tire that gives both good highway performance and winter traction on our Bayville New Jersey roads. Outside of these three main categories, some people in Bayville with trucks and SUVs like a tire that is designed for both on-highway and off-highway use. They can handle the rocks and bumps off-road, but still work well on the street. Again, many options depending on the relative emphasis on on-road verses off-road. Tires do a lot of vital work for Bayville motorists. They transfer engine power and braking forces to the road; they handle steering control; and they cushion all those bumps and jolts while driving around Bayville. They also support the entire weight of the vehicle, including you and your passengers. With such important work to do, you want your tires to do their job well. 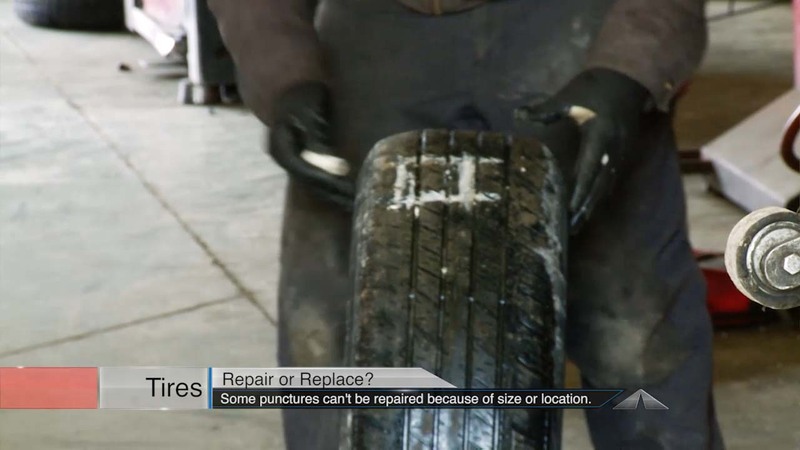 And since replacing tires is fairly pricey, you want them to last as long as possible. Also, there are different rotation patterns for different vehicles. Bayville Auto Care will know which is right for your vehicle. That brings us to wheel balancing. When wheels are balanced, they spin on the axle evenly. When they are out of balance, they wobble a bit. That makes the tires wear unevenly and may transmit a vibration to the car. Your personal Bayville Auto Care service professional puts weights on your wheels to balance them out so that they turn true and smooth. Tires are a big investment for Bayville car owners. They’re critical for keeping you safely on the road in Bayville. The cost for regular rotation and balancing is more than made up in extended tire life. And, can you really put a price on your safety and that of your passengers? Repair or Replace? That’s a question Bayville car owners ask when they have tire damage. Some punctures cannot be repaired because of their size or location. Punctures larger than a quarter of an inch are considered too large to be safely corrected. Punctures in the sidewall or near the shoulders may not be able to be repaired. And sometimes there is internal damage revealed on inspection that indicates the tire should not be repaired. Run flat tires should not be fixed. Repairing high performance tires may make them unsuitable for motorsports. Your personal Bayville Auto Care service specialist can survey your damaged tire and tell you if it can be safely repaired or if it should be replaced – and then help you get back on the road. You know you need new tires, but you’re not sure what type. You look at a tire to get the size: 225, 50, R, 16, 92, H. All the way to the Bayville service center you keep repeating it over and over. You even say it over in your mind while waiting in line. Then you get to the counter and the manager asks what size you need. Then your mind goes blank. Tire size can be confusing for many Bayville motorists. There’s so much on the side of the tire, and it’s hard to keep straight. Even though there’s a lot on a tire – if you know what it all means, it’s actually more helpful than confusing for Bayville tire shoppers. Let’s start with the size number. The 92 is the load rating index – it’s the load carrying capacity of a tire. The higher the number, the more it can safely carry. Your empty sedan can be safe with a lower number, but you’ll need a higher rating if you routinely haul heavy loads around Bayville. The next letter is the speed rating. Not all tires sold in Bayville are speed rated. The ratings generally follow the alphabet: the further up the alphabet, the higher the speed rating – with the exception of H – it comes between U and V (don’t ask why). There’s a lot of fine print that most Bayville auto owners probably need a magnifying glass to read. But there are a couple of other large print items of interest. One is the tread type: highway, mud and snow, all season, severe snow, etc. And then there’re the Uniform Tire Quality Grading System markings. The first is a tread wear index. 100 is the base line – a lower number is poorer and a higher number is better. All things being equal, a tire rated 200 would wear twice as long, on a government test track, than one rated at 100. These wear grades are only valid within the auto maker’s product line – Bayville car owners can’t compare with other manufacturers. And it’s essential to note that a lower rating might be just what you want – a high performance, sticky tire has a softer rubber compound and won’t wear as long, but boy, will it take those corners on twisting New Jersey roads. It’s safe for Bayville car owners to go with the car maker’s original equipment recommendations that came on your car. But if you want to make adjustments, you’ll now be better equipped to communicate with your personal Bayville Auto Care tire professional. Remember snow tires? They were basically just regular tires with big, knobby lugs to get them through deep snow. They were loud and rode hard, and Bayville drivers couldn’t wait to get them off the car. Then along came television advertisements for “all-season” radials. New Jersey car owners ran out and bought some and we thought we were done with snow tires forever. Tires have come a long way since then. Modern winter tires sold in the Bayville area are much better designed for the wide range of detrimental conditions that come with New Jersey winter weather. They are made with a rubber compound that helps them stay flexible in cold weather. Regular tires become hard and stiff at Bayville temperatures below 45°F, which reduces their traction. That’s an essential concern in winter, especially with snowy or wet Bayville conditions. But it also means that Bayville auto owners are better off with winter tires in cold weather even when it’s dry. Many winter tires use a micro-pore compound that lets the tire bite into ice and snow. They have wider grooves around the tire that help expel snow. They have a rounder casing to better cut into the surface of snow. Modern winter tires available at New Jersey tire shops also have sipes, or thin slits cut into the tread. The edges of these sipes can grab ice and snow so that the tire retains traction on almost any surface. The sipes also help to expel water and slush from the tread. In short, a lot of time and engineering has gone into improving winter tires. The all-season tire that is popular among Bayville drivers is actually a compromise between summer and winter performance. This means they give adequate performance for Bayville auto owners in either season, but aren’t great in either. Summer tires give great performance in hot weather, but lousy performance in winter. Bayville drivers need to put more thought into their tire choices these days, but that also means they get a lot better performance for their money. If you want the performance that new winter tires can give you, you should have them properly installed at your Bayville service center or Bayville Auto Care. It’s best to purchase four snow tires and put them on all the wheels of your vehicle. But if you only want two, you need to put them on the rear of your vehicle, even if you drive a front-wheel drive vehicle. Bayville car owners always want to put the tires with the best traction on the rear of the vehicle. Imagine this: You take a corner on an icy Bayville road and your rear end starts to slide. What happened is that the front end slowed for the turn, but the rear end hasn’t figured that out yet. If you have high-traction tires on the front of your vehicle, that makes the problem worse. You’re slowing the front end faster and harder, which makes the back end fishtail even more. Putting the higher traction tires on the rear will give Bayville auto owners more control for turns, regardless of the type of vehicle driven. Of course, that makes putting high-traction tires on all of your wheels even smarter. Why not give all of your tires the best traction they can get? Some Bayville assume that four-wheel drive or all-wheel drive vehicles only need winter tires on two wheels. Why? Doesn’t it make sense to give all four wheels the same level of traction and control? Four-wheel or all-wheel drive cannot compensate for poor traction. Another false assumption held by many Bayville auto owners is that if you have traction control and anti-lock brakes, you won’t need winter tires. Traction is essential for good acceleration, steering and stopping. And tires provide traction. Traction control and anti-lock brakes can only improve on that traction. The better the traction, the better the traction control and anti-lock brakes will work. In other words, the better the tires, the better those systems will work for Bayville auto owners. If you’re shopping for winter tires and live where there is a lot of snow in New Jersey, look for a mountain with a snowflake in it molded into the tire’s sidewall. This symbol means the tire complies with severe snow standards. All-season tires have an M&S stamped on the sidewall. M&S stands for mud and snow. For more essential auto advice about tires for any New Jersey season, meet with your personal Bayville Auto Care tire professional. They can help you choose the right tire for your area and for your driving needs. For the best performance from your tires, whatever the season, don’t forget preventive maintenance. Keep your tires up to pressure for best durability, safety and performance, but don’t overinflate them. Remember, good car care provides the safest road for all of us Bayville auto owners. A lot of people get custom wheels in Bayville. When you do this yourself (over the internet . . .) you could run into trouble if you’re not careful. Sometimes, once they’re mounted, they just don’t fit right. The tires rub in turns or on bumps. You don’t want that. Consulting your Bayville Auto Care tire professional can ensure you get the right fit. First he’ll ask you a series of questions about your Bayville driving needs and what you want in your new wheels. Now, not every wheel can go on every car. Care must be taken so that tires and wheels are not too large or that the wheel is centered too far towards the outside or the inside so the tires rub. If you don’t want to make any modifications to your sedan, you would need to focus on the wheels that would fit. With trucks, some Bayville people like much bigger tires so they need a suspension lift. Also, most Bayville drivers don’t realize that you need to keep the rolling diameter of your new tires – that’s, like the overall height of the tire – very close to what came from the factory in order for your sedan anti-lock brakes and stability control systems to work properly. Either way, there are hundreds of wheel and tire choices to choose from in New Jersey. You can pick the style of wheel you want and then talk with your personal Bayville Auto Care tire professional about how big the wheel should be – and how to select the right tire for your sedan. Your Bayville Auto Care service advisor will help you find the best tire to meet your style, performance, ride and handling needs in Bayville. Every Bayville vehicle owner has to purchase tires at some time or another, so it’s a good idea to understand what the choices are. The best seasonal performance is achieved by purchasing tires to match the season you are driving in. Summer tires are designed for hot temperatures. The tread is engineered for good traction on dry or rainy New Jersey roads. But the rubber compound in summer tires gets stiff when temperatures drop below 45°F, and snow and mud can pack into the tread, reducing the traction of the tire. Winter tires are designed for good traction on snowy surfaces. The tread actually throws snow off of the tire as the wheel turns. The rubber compound in a winter tire is soft so that it will remain flexible at Bayville temperatures below 45°F. At higher temperatures, however, the softer rubber wears down rapidly. All-season tires sacrifice some of the extreme performance of summer or winter tires, but they maintain adequate traction in either type of Bayville weather. So your first consideration when buying a tire is where you live in New Jersey and where you usually drive. If you require maximum summer and winter performance you can go with dedicated summer and winter tires; you would just need to change out your tires each spring and fall. For serious winter driving in New Jersey, look for tires with a severe snow rating. These tires are labeled with a mountain-and-snowflake logo. Your second essential consideration is the quality of tire to purchase. Summer, winter and all-season tires come in a variety of grades and styles at New Jersey tire stores. Bayville car owners will want to purchase a tire that will give them good wear and that will handle their driving style and road conditions. Your Bayville Auto Care tire professional can give you auto advice as to which type of tire will best fit your needs. Bayville auto owners who drive off-road around New Jersey may want to look at a high-grade tire that is designed for off-road use. These tires are designed to handle the extra wear of off-roading while still giving good performance on Bayville streets and interstates. There are a number of options to choose from so that you can find the right tire whether you are only an occasional off-road explorer or a serious rock climber. New wheels can be purchased in Bayville as a statement of style or to add personality to your sedan. There are almost unlimited options. If you change the size of the wheels on your sedan, however, you will need to get some professional help to make your vehicle compatible with its new wheels. Talk to your Bayville Auto Care service professional for more information about tires. A lot of us Bayville car owners like our vehicles to reflect our personalities. We’re picky about color and body style. We’ll customize anything from floor mats to window tints to license plates. One popular way for New Jersey drivers to customize a vehicle is to get new wheels. Fifteen or sixteen-inch wheels used to be the factory standard, But today, because a lot of Bayville car owners like the look of larger wheels, many vehicles are available with seventeen or eighteen-inch wheels. Optional wheel packages of twenty inches or more are also available in Bayville. If you want to upsize the wheels on your current vehicle, however, you should know it’s not a do-it-yourself project. There are critical factors involved in ensuring your wheel change doesn’t jeopardize the safety of your vehicle. First of all, it’s vital for New Jersey auto owners to understand rolling diameter. The rolling diameter is the overall height of a tire. If you increase the rolling diameter of your tires when you upsize your wheels, you may have to modify your suspension to make sure the larger tires fit in the space and don’t rub in turns or over bumps. If that’s more work than you’re willing to do or pay for, then you need to maintain rolling diameter when you change your wheels. It’s not as hard for Bayville motorists as it sounds. Imagine a doughnut. That doughnut represents rolling diameter, so you can’t make the doughnut bigger. However, you can increase the size of the doughnut hole. That gives you a bigger wheel. Tires with reduced sidewall on larger wheels will preserve your rolling diameter. Rolling diameter is critical because your wheels and tires still need to fit inside the wheel well. Also, your speedometer, odometer and anti-lock brakes are all programmed to work with a specific rolling diameter. You’ll throw off the readings on your speedometer and odometer if you change your rolling diameter. And for your anti-lock brakes to work properly, your rolling diameter has to be within 3% of factory recommendations. While some Bayville auto owners who upsize may not be concerned about meter readings, throwing off the brake system is a serious safety hazard. Further, many vehicles in Bayville are now equipped with electronically controlled suspensions. Changing the rolling diameter will negatively affect this system as well, which can lead to a less smooth ride and lower handling performance as well as dangerous safety concerns. Your personal Bayville Auto Care tire professional may be able to reprogram your vehicle’s computer to adjust for a larger (or smaller) rolling diameter. To improve their strength, the shorter tires will also be slightly wider than your previous tires. But this means you’ll have a larger contact patch, or, in other words, a larger area of tire making contact with the road. This can actually increase your handling performance and decrease braking distances. Many New Jersey auto buffs customize their wheels just for this reason—they want the improved performance rather than looks or style. If you drive a truck or an SUV around Bayville, you might be interested in the extra control an upsized wheel can provide. Now, that larger contact patch still has to fit inside your wheel well without rubbing when cornering or when bouncing over bumps or potholes on Bayville roads. This is termed fitment, and you may need a few vital adjustments so your new wheels will fit properly. You may need spacers so that your brakes will fit inside the new wheels, as well. 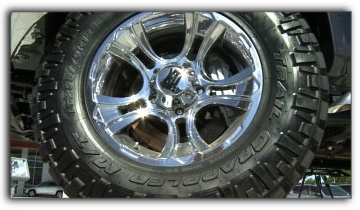 Bayville Auto Care tire professionals are experts at mounting, adjusting and customizing wheels. They can give you a lot of good auto advice about wheels and tires and how they affect driving performance and car care. They can help Bayville motorists select wheels and tires that will suit their driving needs and habits. For example, if you drive off-road around Bayville, you should consider a higher profile tire. This type of tire will protect your rims from pricey damage while you’re bouncing over rocks. Or, if you tow a trailer or haul heavy loads around New Jersey, you’ll want a tire with a load rating equal to your demands. Your personal Bayville Auto Care tire professional can help you with these types of concerns. Once you’ve got your new wheels, have your personal Bayville Auto Care service professional inspect to see if you need an alignment. You don’t want those new wheels and your higher performance compromised by poor alignment. Get the most out of your investment by getting the work done right at Bayville Auto Care in Bayville. Last but not least, remember tire pressure. With larger wheels, your new tires will hold less air and they’ll need slightly higher pressure. You’ll need to stay on top of critical preventive maintenance and keep them properly inflated. Be sure to inspect their pressure at least once a week. If you don’t keep your tires at their correct pressure, they will wear out really fast. It will also cut down your braking and handling performance. So smile and show off your vehicle around Bayville. Make it all yours. Bumper stickers, vanity license plates, custom wheels — strut your stuff! Most importantly, the wheels you buy need to fit your vehicle. Not all wheels are created equal. Too many Bayville motorists have bought a set of wheels that caught their eye, then, after going to the work of mounting them, have found that the wheels don’t fit right and the tires rub against the sedan when they turn or go over a bump. To ensure a proper fit, you can consult with your Bayville Auto Care tire professional. He/she can also help you find tires that are suited to your driving habits as well as your sedan. You may find their auto advice invaluable, and you’ll probably be happier with your new wheels once you purchase them. But if you just have to have that set of wheels, and you’re willing to pay for them, you can modify your vehicle to fit the wheels. Again, you should seek a knowledgeable Bayville professional’s help ahead of time. For example, if you want a bigger set of wheels on your pickup truck, you can get a suspension lift so they will fit the truck. A professional Bayville custom wheel shop can help you get the work done right. The anti-lock brakes and stability control system on your sedan are engineered to work with a particular height of tire. This is another reason car owners should be careful when purchasing custom wheels in Bayville. The new wheel and tire combo needs to match the height of the tires that came with your vehicle. If you change the size of your wheels, you need to get your engine’s computer reprogrammed at Bayville Auto Care to accommodate the new tire size. New wheels shouldn’t just fit your vehicle, they should also fit your lifestyle. There are hundreds of styles and sizes to choose from. You should do a little research about which wheels and tires will best fit your personality, give you the performance you want, and meet your handling needs. We’re not saying you shouldn’t personalize your ride, we just want you to be happy with the result. Talk to us at Bayville Auto Care in Bayville. Getting New Tires In Bayville? There are so many tire choices in the Bayville, Beachwood, and Forked River area, selecting the right one can be a bit overwhelming for Bayville car owners. And even though it’s kind of fun to have new tires on your sedan, they’re a significant investment for most Bayville folks so you want do it right. Tip: talk with your personal Bayville Auto Care tire professional. He’ll help you sort through the choices. Here are some of the essential issues you’ll talk about: One is size – you know, all those numbers on the side of the tire. The right size is vital. All new vehicles are required to have stability control which, along with other important safety systems, is calibrated to work with specific tire sizes. Your Bayville tire professional can help stay within auto makers’ specifications or program a different tire size into your sedan’s computer. And you’ll want to discuss how and where you drive in Bayville to determine the type of tire you need: summer, winter, all season tires or all-terrain. There are tires for every Bayville auto owner’s needs. Like we said, tires are a big investment, so you want to get a good value on tires. Now that doesn’t always mean the cheapest tire. A top tier tire from Bayville Auto Care will last a long time and give Bayville motorists good performance throughout its life. Tires sold in Bayville bargain tire shops may not live up to that promise. Again, your personal Bayville Auto Care tire professional can give you options that offer the best long-term value within your immediate budget. Last, with a 2-wheel drive vehicle, it’s vital to always replace both tires on an axle. Modern sensors and computer safety systems for sedan brakes, stability and traction control need both tires to have the same amount of wear to work properly. And always put the new tires on the rear so you don’t fishtail in a turn. With all-wheel drive you should replace all four tires at the same time. Schedule a tire inspection at Bayville Auto Care to see how much life is left in your sedan tires and seek the help of a professional when choosing new shoes for your vehicle. This entry was posted in Tires and Wheels. Bookmark the permalink. | Comments Off on Getting New Tires In Bayville?